Biographer Caroline Fraser has been a fan of Laura Ingalls Wilder’s books since childhood, when, like millions of readers, she would let her imagination take her to the American frontier to join in the adventures of the pioneer family. 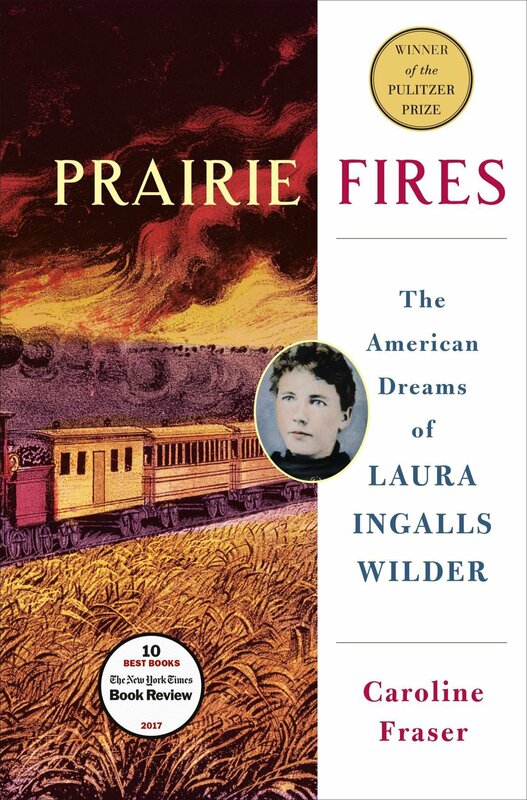 Fraser’s 2017 deep dive into the writer’s life and the historical context surrounding the Little House books, “Prairie Fires,” won the Pulitzer Prize for biography. Fraser’s journey began more than six years ago, when she edited the Library of America’s boxed set of Wilder’s books, which were originally published between 1932 and 1943. Fraser traveled to Wilder’s birthplace of Pepin, Wisconsin, as part of her research. This month marks Fraser’s first visit to Madison, despite working with the Wisconsin Historical Society to research the biography of the beloved children’s book author. Fraser holds a Ph.D. in English and American literature from Harvard, and calls Santa Fe, New Mexico, home. Fraser, 57, spoke about her fascination with Wilder’s life in advance of her appearance at the Wisconsin Historical Society. She also touched on the controversy surrounding the American Library Association’s decision to drop Wilder’s name from its children’s literature award, an attempt to distance the honor from racist portrayals of Native Americans and African Americans in the books. A: There was a long period of gestation of this project. I began probably where many other people began with Laura Ingalls Wilder. I had read the books as a kid and loved them. Then in the mid-‘90s I was listening to NPR and there was a really extraordinary story about a man who had written a biography of Wilder’s daughter, Rose Wilder Lane, claiming that Rose was really the author of the Little House books. I ended up writing a long piece for the New York Review of Books about that claim. At that point I looked into a lot of Wilder’s manuscripts. I ended up feeling a little bit dubious about the extent of the claim that he was making. I thought it was exaggerated. That led, some years later, to my being asked to edit the Library of America’s two-volume edition of the Little House books. That was really what inspired me to think about a new biography. For that edition I wrote a fairly extensive chronology of Wilder’s life. It was so fascinating to me, especially the point in her life when she was experiencing and interacting with these major movements in the history of American settlement, the frontier, the Plains-Indian Wars. All of that was so fresh to me. I hadn’t realized how rich her life was in the historical connections. Q: How close are her Little House books to her actual life? A: They’re very close in some ways. To her they felt very true. “True” was a word she used over and over again. Everything in the books she would say was “all true.” I think it felt that way to her because she was resurrecting her family and their lives. I think she did feel very close to her parents, she really idolized her father. But in interesting ways, her desire to cast her parents in the best possible light led to ways in which the book didn’t tell all the truth. They told a certain amount of the truth, but she left out quite a lot of the difficulties. Even though the books are filled with hardship and natural disasters, she left out various things that might have been attributed to her father, showing that he wasn’t the greatest farmer or the most reliable provider. She was aware of that, but she loved him regardless. She left out the things that tended to detract from that picture. Q: What about her relationship with her daughter? Did you uncover anything surprising? A: Yes. In many ways, that’s one of the most difficult and painful aspects of Wilder’s adult life. That they never really established the warmth that Wilder herself had felt with her own family growing up. Nonetheless, Rose would be crucial in producing these books. It was Rose who had the professional experience and the relationships with publishers. Rose was a very talented editor. She urged her mother to take on this job of writing about her life and helped her shape the books, helped her find an agent, a publisher. So I don’t think we’d have the books if it weren’t for Rose, on the one hand. But on the other hand, I don’t see Rose as a ghostwriter. Q: Why do you think the Little House books are still so popular? A: People feel real affection for them. I think the portrait of the nuclear family is and has been incredibly influential in the way that people want to see the American family. I didn’t grow up in the Midwest but all of my grandparents were from farming families in the Midwest. Even as a child I grasped that in some way these books were a little bit about my own family history, and I think that continues to be very special to people. People find them incredibly soothing and wonderful even as adults. Children are often swept away by the adventure of them. They’re full of marvelous survival stories and beautiful descriptions of the process of building a little house or digging a well or planting crops. I continue to think there’s something about that nuclear family that is really at the heart of people’s affection for the books. Q: What was your reaction to the American Library Association changing the name of their children’s literature award? A: That was something I happen to know was a long time coming. Some years ago, I talked to a number of librarians and teachers about their struggles to deal with the issues of integrating these books. It used to be a very common thing for teachers to read the books to their classes over lunchtime or something, as a treat. That has become more and more problematic as our perceptions of Native American history and what’s appropriate to read to children have evolved. I wasn’t surprised that the Library Association did this, and I can see their point of view. I think if I had been in their shoes I might well have felt the need to do that too. It’s a complicated issue. The Library Association did come out and say that they hoped that this wouldn’t be seen as any kind of censorship, they hoped it wouldn’t discourage people from reading the books, and I take them at their word. I think they wanted to make the name of their award more inclusive in the face of a number of complaints that they’ve had over the years. I also understand the disappointment of fans and scholars of literature as I am. I think this is different because this particular group of librarians deals entirely with children. That’s a different situation than, say, teaching this in a college or reading this in any other context with adults. When: 5:30 p.m. welcome, 6 p.m. reception, 7 p.m. book signing Thursday, Sept. 27. Where: Wisconsin Historical Society auditorium, 816 State St.